★ If you have been looking for the best, most practical and extremely durable Expandable Garden Hoses, you have come to the right place! ★ A Super Expandable Garden Hose Meet Your Various Needs Easily with High-quality Materials and Multi-functional Design. ★ Handy, Lightweight Expandable Water Hose, That Expands Up To 3 Times Its Original Length. ★ Make Watering Simple and Efficient. The Best Choice for You Enjoying the Gardening Time with Families. The innovative design of the new generation of garden hose can be extended up to three times, and retracted to its original length after use, so that expandable garden hose could effectively reducing weight, easy to carry and saving space. Our Expanding Garden Hose is made of durable and high quality materials, pressure-resistant latex are safe to use and effectively prevent bursting, leakage, and cracking. The solid brass fittings of this expandable water hose are rugged and resistant to leakage, corrosion and rust. This Expandable Garden Hose can suit different occasions: car wash, lawn maintenance, pool cleaning, house cleaning, yard washing requirements and even as a shower for your beloved pets, our garden hose can meet the various water needs in your garden life! If there are any manufacturing problems with the garden hose, we can provide a 60-day money back guarantee and a one-year free replacement service. Monyar's US aftermarket team provides you with the best service and best shopping experience! 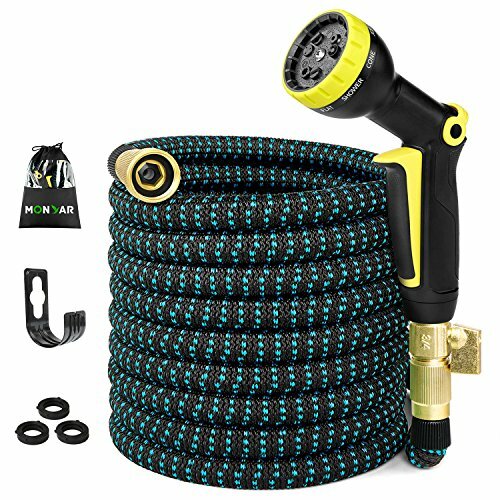 Monyar Expandable Garden Hose is a Garden Hose that's perfect for everyone. CLICK [Add to Cart] and get Expandable Water Hose NOW, it's totally risk-free. 【Best Choice for Garden Hose】 - The Expandable Garden Hose uses ultra-high toughness fiber to effectively protect the latex hose. This Expandable Garden Hose can withstand high temperatures (140°F) and the water hose can expand to 3 times its original length. This water hose has toughness, won't curl, twist, knot and break. After use, the Expandable Garden Hose can be retracted to its original length for easy storage and portability. 【Flexible and easy to carry】 - The Expandable Garden Hose is made of the highest quality materials. The latest design ensures that the water hose will not kink, crack or tangled, and can be automatically expanded 3 times. After use, the water hose can be contracted to the original length.This length allows the Garden Hoses to be easily hooked to the faucet. Drawstring bags make it easy to take the Expandable Garden Hoses to anywhere, making your family garden life easier. 【9 Spray Patterns Nozzle】 - The Expandable Garden Hose has 9 spray nozzles, good quality, non-slip, and comfortable to use. Change the spray pattern of the Expandable Garden Hose b.y rotating to control the water pressure to suit different occasions: car washing, lawn maintenance, swimming pool cleaning, house cleaning, yard washing, even shower for your favorite pet, our Expandable Garden Hoses can satisfy All water needs in your garden life! 【100% Pure Brass Connector】 - High quality 100% pure brass connector for Expandable Garden Hose. We carefully manufacture 3/4 inch brass connectors for Expandable Garden Hoses that meet all American standards. They make the water hose completely leak-proof and rust-proof and will not crack. This expanding garden hose is also equipped with a brass on-off valve that switches water quickly and makes the use of Expandable Garden Hoses more convenient and comfortable. 【12 months after-sale guarantee 】- Our Expandable Garden Hose is a high-quality product, and professional customer service is our commitment to ensure that you are 100% satisfied. We offer a 60-day money back guarantee and a 12-month manufacturer's warranty for our Expandable Garden Hoses, and our US after-sale service team will resolve your issue within 24 hours. If you have any questions about this product by monyar, contact us by completing and submitting the form below. If you are looking for a specif part number, please include it with your message.